He is The Master of Men, a horrific hero striking terror in the hearts of criminal and madman alike. He is The Spider! 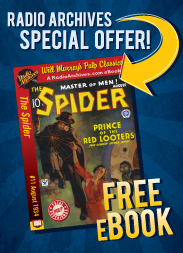 The Spider series, all 118 issues, has been produced as eBooks by Radio Archives. Each eBook is the Total Pulp Experience. These exciting pulp adventures have been beautifully reformatted for easy reading as an eBook and features every story, every editorial, and every column of the original pulp magazine. As a special bonus, Will Murray has written an introduction especially for this series of eBooks.